Gonzalo Jiménez de Quesada, was born in Córdoba in 1499. Chief magistrate of Santa Marta, he was commissioned to explore the Magdalena in search of El Dorado. He set out in 1536, and in 1538, after incredible hardships, he defeated the Chibcha and founded Bogotá as capital of the New Kingdom of Granada. A hard taskmaster but an able leader, Quesada wavered between humane and brutal treatment of the native population. He obtained fabulous amounts of emeralds and gold. Unexpectedly meeting Federmann and Benalcázar, who claimed the same territory, Quesada persuaded them to return with him to Spain, where settlement could be made. There he was ignored until 1550, when he was appointed marshal of New Granada and councilor of Bogotá for life. In 1569, still seeking El Dorado, he led a lavishly equipped expedition to the confluence of the Guaviare and Orinoco ; he and what remained of his company returned wasted and penniless after three years. Still later, suffering from a skin disease and carried on a litter, Quesada put down an indigenous revolt. It's said that he was the model for Cervantes's Don Quijote. His own account of his conquests has been lost, but excerpts copied by others from the original survive. He died in Mariquita in 1579, and his remains were taken to the cathedral at Bogota. In "The Last Lord of Eldorado", after the Ducks discovered the property title of El Dorado, signed by Jiménez de Quesada, Federmann and Benalcázar, they look in the Junior Woodchucks' Guidebook and find about the meeting of the three men, about the fact that we don't exactly know which bargain has been striked between them and that they went back to Europe. Later, they also discover that the three men established a Welser bank, with the treasure of El Dorado. 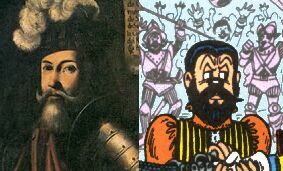 Quesada acted as the lawyer, and wrote the legal document, Federmann created the bank, and Belalcazar ordered the soldiers to drive the Chibcha Indians and their King, the Gilded Man (this explains why, in Barks' "The Gilded Man", the actual Gilded Man lives in Guyana instead of Omagua).